I never thought that it looked quite as bad as many people said, but the improvements over the last few years have resulted in a track that is, yes, attractive. 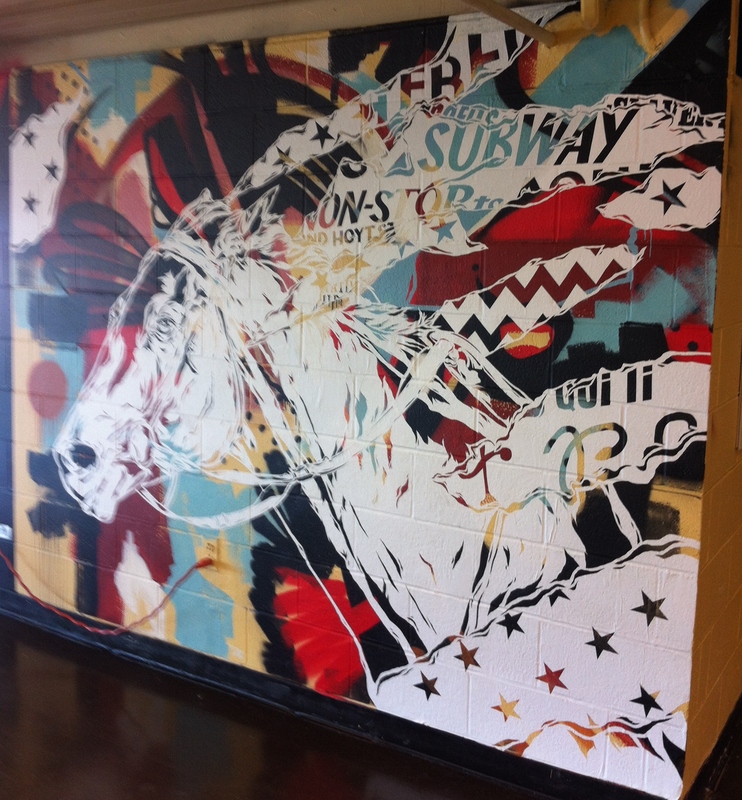 The murals on the main floor debuted about a year ago; eye-catching, intriguing, they are ubiquitous, and while the Big A regulars don’t seem to pay them much attention, they offer color and energy, often unexpected. Big racing photographs, too, of Samraat, Stay Thirsty, and other Aqueduct stakes winners are displayed prominently, a vibrant reminder of why we’re at the track, and of memorable performances that have taken place at the historic track. Most of the place seems to have gotten a new coat of paint, and perhaps a lighting upgrade; the interior seems bright, from the main floor all the way upstairs. I confess that I didn’t notice the newly installed “airport-style” seating. The main-floor dismal, smelly bar, which seemed smoky years after indoor smoking was banned, has been replaced, resplendent in the Big A blue that is featured prominently throughout the place. 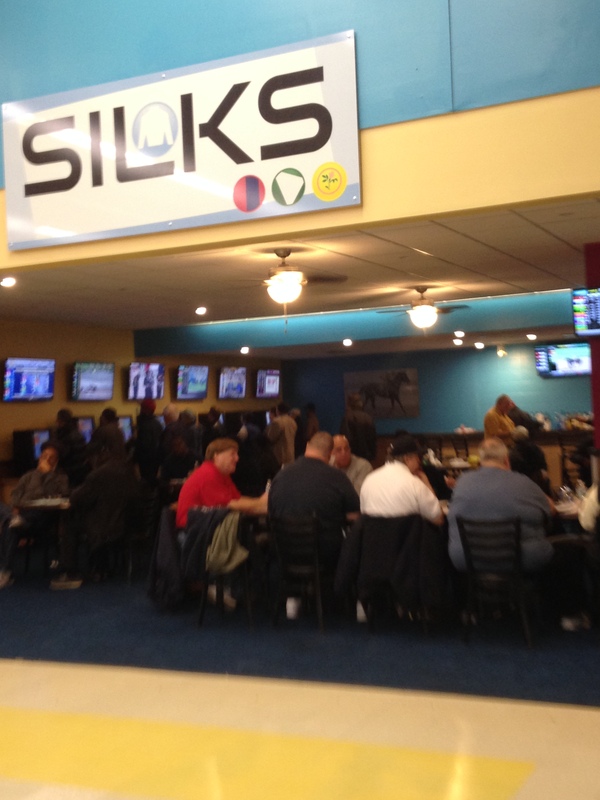 Champs has become Silks, with new televisions and tables and a handful of bar seats. It was full on Saturday afternoon; once a place to avoid, it now seems inviting. The third floor, Equestris aside, still seems like a missed opportunity. The bar in the Manhattan Terrace, that light-filled, west-facing space that offers vistas of its eponymous island, is still unstaffed; two outdoor terraces have been given over largely to smokers (and birds). Enclose them, and you’ve got premier hospitality areas with glorious views and natural light. Longshots opened last April, with free admission for NYRA Rewards customers and the promise of food service. Six months later, NYRA Rewards customers are charged $5 to get in, and the only food on offer appears to be potato chips, though I am told that it might be possible to order from a limited menu of sandwiches. A scan of the place mid-card didn’t reveal anyone taking advantage of that opportunity (though down in Silks, one enterprising group had taken it upon themselves to bring in a pizza). With its expansive bar, plentiful tables, and dozens of televisions turned to a variety of racing and sports channels, Longshots should have been packed; instead, it was maybe half-empty, and it didn’t take long to figure out why. 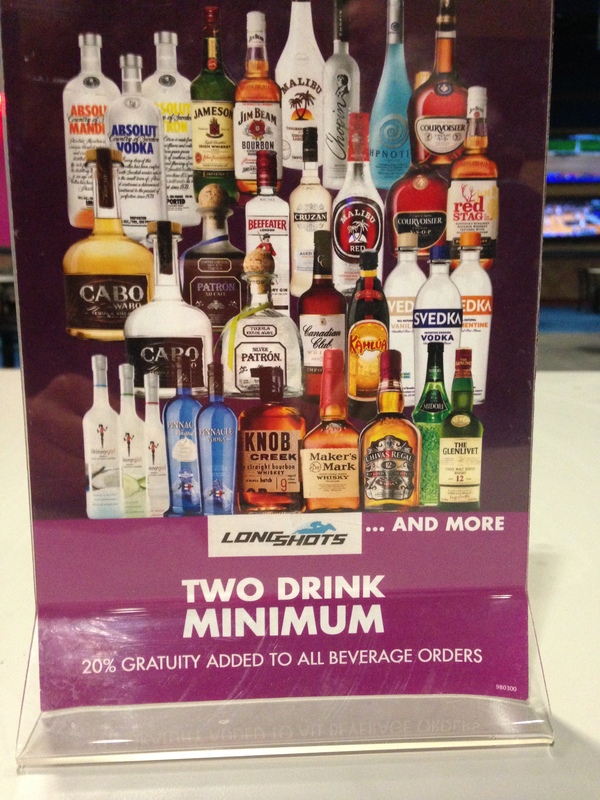 Despite assurances last spring that NYRA would wrest concessions back from Genting, that table announcement proclaimed loud and clear that Genting is still in charge, the two-drink minimum and 20% gratuity practically a trademark of the casino company. The 20% required tip made its presence known at Longshots when it opened, to the chagrin of NYRA’s hospitality department, but with Genting still in charge of all concessions on the track side–including Equestris, at which the buffet is a reasonable $30–price gouging is alive and well at the track that this year marks its 130th anniversary. Want a bagel from a snack stand? Be prepared to shell out $6. Add a coffee? $4.50. $13.50 will get you a burger, or two hot dogs, or wings. Big spenders might spring for the $18 cheesesteak, with another $9 for a 20-ounce soda. A side of fries? $7.50. Domestic bottle of beer? $12. Assuming that the prices at the bar in Longshots are comparable, if you’re a NYRA Rewards customer, you’re spending $25 to walk in the door, and that’s before you wager a cent. Longshots replaces the Sunny Jim Room on Aqueduct’s main floor, a cool space tucked away on the west side of the clubhouse. Light streams in its south-facing windows, and though the decor and amenities are outdated, the room is cozy, warm, and comfortable. 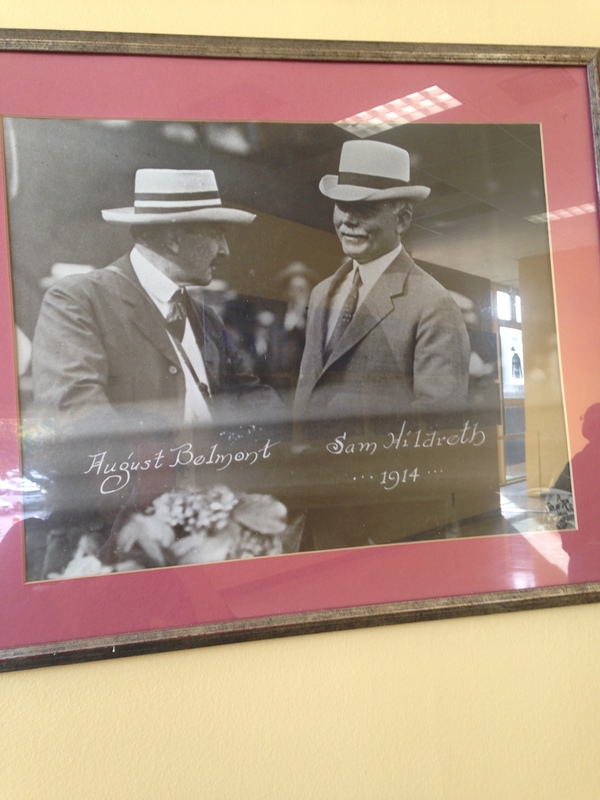 I loved looking at the wonderful old pictures that graced the walls, including one of August Belmont and Sam Hildreth, dated 1904. It now hangs outside the room, in an area that you are unlikely to walk past, but do seek it out. It’s remarkable. 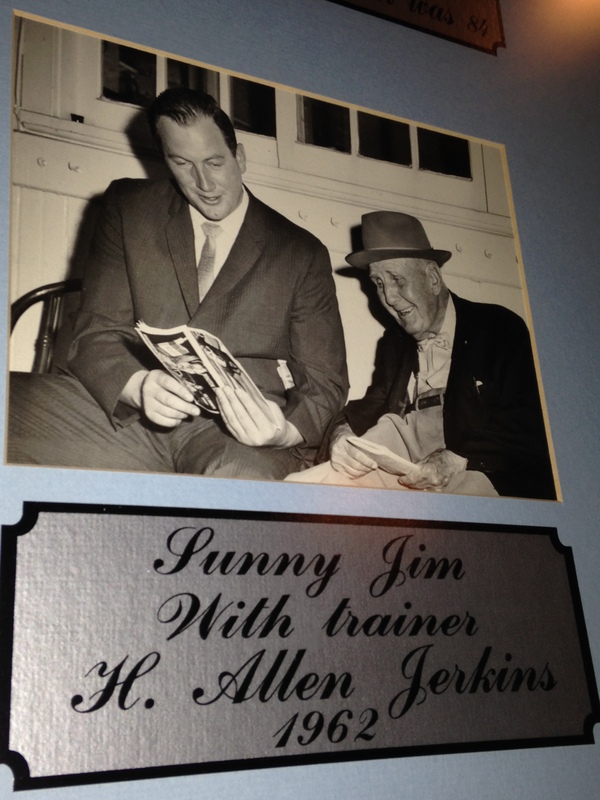 Fittingly, a photo of Sunny Jim Fitzsimmons and Allen Jerkens used to hang inside, too; like all the other photographs, it’s been removed, and last weekend, no one could tell me where it had gone. Nor could anyone tell me what will become of the Sunny Jim Room. Let’s just hope that Genting doesn’t get its hands on either of them. I haven’t been to the Big A in years, but am eagerly anticipating my return on Cigar Mile Day, and I will certainly remember your observations here as I explore the old haunts! How I miss days gone by in the 70’s when my beloved Saratoga wasn’t the only NYRA track to attract crowds, and when Horse Racing was still truly the Sport of Kings! I hope you have a good day there, Weezie. Aqueduct definitely has its charms and I’m a big fan. Hope we get to say hello! Lightweight NYRA CEO Kay out of touch with players. Nonsensical theme if enhanced experience a joke. NYRA management in desperate need of replacing. Recent sharp handle declines at NYRA a testament that gamblers are dissatisfied with the present situation, top to bottom! Mike, the post makes clear that the concessions are run by Genting. It has nothing to do with NYRA. Teresa,yes, re the concessions/Genting.Aqueduct has become a second rate venue by appearance and qaulity of racing. Friends on the NYRA board will NOT attend or bring guests to Aqueduct. Sure there have been improvements but its still a dive! Was also speaking about ANY price increases by NYRA, admissions or otherewise, at a time when players are leaving the game more than coming into it.I reiterate, Kay a lightweight without credentials to a run a $2billion gambling businersss and it shows. Got it. So you’re posting a venting anti-NYRA comment that has nothing to do with the post I wrote. Thanks for the clarification. “Real and serious issues with NYRA” about which I write and comment regularly. And which have nothing to do with this post. This I disagree with…..if NYRA’s customers are being ripped off, it is their responsibility to try and rectify. The prices Genting charges racing fans compared to what they charge casino patrons for the same items is price gouging….and they should answer for it. Let them explain why a hamburger that cost $8 six months ago, now costs $13. Most racing fans are on a budget and NYRA should do more to protect their interests. If Genting is responsible for the ridiculous pricing at Aqueduct then NYRA has a responsibility to its fan base to fix that. I am not visiting the casino I am their as a customer of the NYRA and expect to be treated fairly and responsibly. A recent $17.50 gin and tonic is certain to keep me from visiting Aqueduct anytime in the near future. I would rather take my business to a local bar that offers off track betting, stay at home and bet on line, or visit the local OTB. Not sure where you’re seeing anything about a $17.50 drink? Seeing? I was there last week and ordered a gin and tonic. While the bartender fumbled around at the cash register I casually sipped my drink…The bartender came back with the bill, and sheepishly told me “the drink is very expensive”. when he told me it was $17.50 I asked him why he didn’t tell me that before i started drinking it? But it’s not like it was the first time I been ripped off at the track, so I paid the man and, since i been taught this by my dad at a very young age, proceeded to tip him when he told me No, a 20% gratuity was already added to my bill…..SERIOUS…defend all you want the prices are a joke, and enough to keep me away. “Trotter1,” I didn’t “defend” anything. I asked you a question. I was told earlier today that mixed drinks were $12. And that’s why I asked where you saw that the prices were higher than that. Moving forward, I’ll bring a sandwich with me……I’ll never spend another dime on concessions there. The first time I went to Aqu after the casino opened, I attempted to get a cup of chowder (a NY racetrack tradition). There was no soup available at either of the 2 “new” concession stands. I then spoke to two chefs standing inside the Equestris entrance. They shook their heads in disbelief and kindly directed me to get a cup of lobster bisque at the buffet table, no charge. A cup of soup is now a $9 purchase. 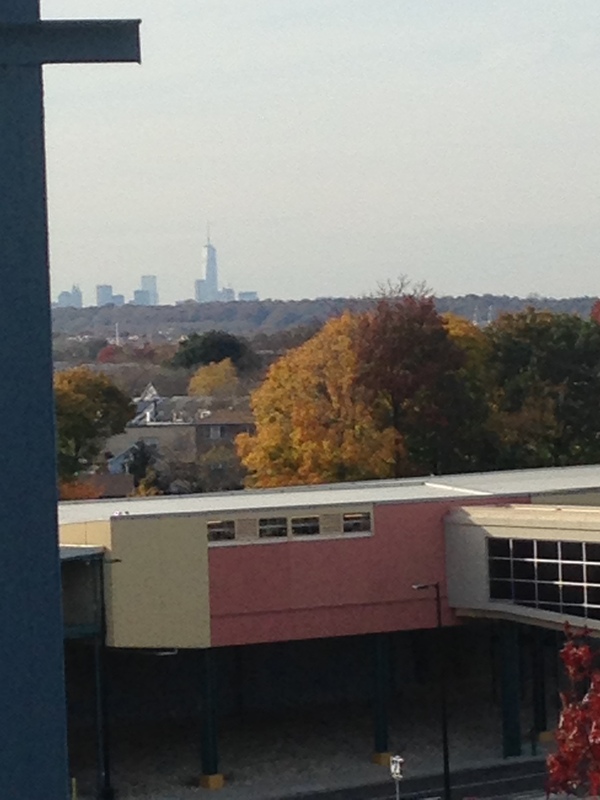 What is preventing NYRA from operating their own concessions? When I spoke with a track representative on Saturday, no information was available on why the concessionaire hadn’t changed. Hoping to find out more this week. Teresa, coincidentally, I went to Aqueduct on Saturday and had pretty much the same impression. While not a palace, the place was vastly improved from the last time I saw it in the spring. The facility was painted, reasonably clean, with new seating and a fairly pleasant place to watch races. I thought the $5 charge for Longshots wasn’t too unreasonable since there’s free admission to the track, it’s relatively uncrowded and you can claim a pretty nice carrel for handicapping, complete with a nice tv and electrical plug. I agree that there’s more to be done on the third floor, which has a lot of possibilities. Once they get the pricing/concessions straightened out (see below), they definitely should reopen the bar on the third floor. I didn’t eat there, but Equestris continues to be a very nice place to watch the races in style. Yeah, my biggest complaint was the concession pricing, which was truly amazing, double Saratoga and seemingly higher than even Yankee Stadium, which is really saying something. I confined myself to a $4.50 coffee. The only thing you can say is that you can bring your own stuff in, which is what any sane person should do. The pricing situation seems to be tied in with the generally terrible relationship between NYRA and Genting. Early on in the relationship, Genting was the sponsor of the Wood Memorial. But all of that ended for reasons unknown, and NYRA sometimes markets other casinos. There seems to be no cross marketing of the two side by side enterprises, (for example, a TV in the casino showing the races or coupons for one of Genting’s restaurants (or free slot play) in the track program) and no effort by NYRA to share the costs and benefits of Genting’s extensive bus system to the casino. It would be better if the two sides could work together, although NYRA should hesitate to find another food and beverage operator if Genting won’t bring the prices down. The workers at the concessions are aware of the problem – the absolute price gouging being done by Genting. As a result, the workers suffer too, because customers refrain from buying, (unless they enjoy being extravagant), and the former get few tips. I did hear from some of the concession workers, that who may manage the Aqueduct food and drink concessions may be changing. The workers aren’t sure what is happening, because it was still being discussed. Centerpoint, who managed the Aqueduct concessions before, may be brought back. But, nobody knows for sure. If Centerpoint does come back, the current concession workers (Genting) go back to working at the casino, if at all. August! Welcome back! Great to hear from you. Yes, NYRA is working on getting new concessionaires for all its food/beverage services; Kay said yesterday that he expects that to happen within a few months. Are they Serious with the pricing of food and drinks at Aqueduct!!! Another example of why horse racing is on its way out. Management simply just doesn’t get as it continues to refuse to engage in a fan freindlly approach.. No reason to go to the track anymore.. I was in Longshots and was hit with a huge bill for 3 drinks. No wonder I was only one at the bar. Bye Bye Aqueduct!! As the article states, the concessions at Aqueduct are run by Genting, not NYRA. i apologize. Yes, I see that you mention this above. However, who is ultimate authority when it comes to deciding who administers the concessions and food at NYRA tracks? Does Genting and NYRA ever exchange ideas on anything? They don’t have what you’d call a great working relationship, and I get the sense that NYRA has zero say in anything that Genting is in charge of. I’ve been told by multiple people at NYRA that they want to get the concessions back, and that they are not happy with the current situation, but a “complicated situation” prevents them from doing anything about it at the moment. Is there someone at Genting who can be reached for comment on this. It says on The NYRA (Aqueduct) website that the buffet is going from $30 to $61 after the New Year ! Who do they think is going to be their customer base? In recent months, Genting has priced the buffet at a price that NYRA has considered unreasonable, so it has covered $27 of each meal in Equestris. After the new year, NYRA will no longer cover that extra cost. You might check the Genting website to see if there are any numbers for customer service. Wow. That is sad! Sounds like NYRA is trying to do the right thing but is not able to call the shots on this. Thanks for the info. The complicated situation is most likely $. Many times the people that are put in charge to run these organizations do not have their fingers on the pulse of whats going on out there.in the world of horse racing. Its too bad because the room they built (Longshots) is fantastic. But it will not sustain itself if they do not get realistic to who the customer base is. My guess is that Genting’s business model for the casino is sky high sticker prices for food and beverage, that can be substantially discounted if you are a regular player and holder of its players card, particularly at high (i.e, platinum).levels. In other words. if you gamble a lot at Genting slot machines, which is obviously what they want, you don’t actually pay the ridiculous prices. On the other hand, Genting does not want lowrollers or nonplayers coming over to the track side for reasonably priced food and beverage so they insist on the same exorbitant prices at the track as they charge at the casino. I don’t think Genting really cares, for example, that very few people will pay $61 for the Equestris restaurant brunch or for crazy drink prices at Longshots so long as it doesn’t undercut their overall casino pricing model. Of course, this is incredibly unfair to NYRA customers and completely inconsistent with the frequently touted idea that the players are “guests”. It also seems to hurt NYRA’s bottom line, at least somewhat, While NYRA may not care much if potential live customers are staying home and betting through NYRA Rewards, a fair number of folks bet with other services or at suburban OTB’s, cutting NYRA’s share of the takeout. Obviously, the right answer is to pull the plug with Genting as soon as possible absent some unlikely resolution (for example, substantial concession discounts for NYRA Rewards players). In the meantime, I think NYRA owes the fans a full explanation of this matter; opaque references to a “complicated situation” just aren’t enough. This explanation should include a timetable for ousting Genting and providing reasonably priced concessions and a specific discussion of any obstacles that may exist toward reaching this goal. NYRA gets a significant amount of money from Genting, according to NYS statute. The problems arise from the fact that Genting is essentially the landlord, and it has, apparently, zero interest in making the racing side pleasant. The relationship between NYRA and Genting is, it appears, completely hostile…though the casino revenue has allowed NYRA to make the improvements that it so far has, and more are, reportedly, on the way. I’ll defer to your far greater wisdom. But if NYRA is receiving “substantial” revenue from Genting can’t they use it to make improvements? Like renters make leasehold improvements independent of the landlord. Sometimes landlords & tenants who don’t like each other manage to have productive relationships. Maybe NYRA’s attitude toward the on-track crowd isn’t very different from Genting’s? It’s a shame but maybe an inevitable one–the older fans have vanished & haven’t been replaced by younger ones. Kids who grew up with fiber-optic computer lines aren’t going to defer their thrills for 25 minutes between races. I used to work for a management consulting firm which did “post-mortems” on failed businesses. Aqueduct/NYRA reminds me of the corporate corpses I studied but with 2 big differences: NYRA’s being subsidize. And at least occasionally, it puts out a terrific product. Maybe some deal can be made like Genting getting table games in exchange for NYRA getting a bigger cut. Or maybe it’s just a doomed attempt to fight the future. Regarding Aqueduct, improvements need to be made to the outdoor seating. One section of seats on the 2nd floor was replaced last year, but the box area and the remaining seats are in very poor condition and with both smoking and profanities pervasive it is not very family friendly. Many people go to the track to watch live racing, but Aqueduct offers few comfortable options (especially as compared to Belmont and Saratoga). Granted there is free admission but perhaps converting part of Equestris into climate-controlled reserved seating and charging a nominal clubhouse admission for 3rd floor access makes more sense than operating a $61 buffet that fewer and fewer people are patronizing.